Isn't she a doll? What you can't see is, that while she's held by her mother, both sets of grandparent's are hovering around her brand new English pram. 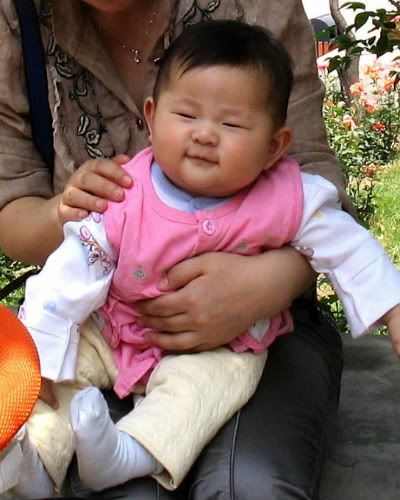 Under China's one child policy she'll probably be very spoiled - a little empress. I hope she brings a smile to your faces. She does to mine. Have a wonderful weekend. 1) Bring granulated sugar and 1 cup water to a boil in a medium pan over high heat. Stir until sugar is dissolved. Refrigerate until chilled, about 1 hour. 2) Add lemon juice, superfine sugar, cranberry juice, and 1-1/2 quarts water to a serving container. Stir until sugar is dissolved. Refrigerate until ready to serve, up to 1 day. 3) To serve, add ice cubes to fill and garnish with lemon slices. Yield: 3 quarts. I'm linking this to Beverly at How Sweet the Sound for her Pink Saturday Event. She absolutely brings a smile to my crabby old face! OH MY! What a cutie!!! She is precious! Awwwwww and she looks very happy. So darling! Just want to give her a big hug! Happy PS! Thanks for stopping by my blog. I love having new visitors! The little empress is darling! What a sweet face! Happy Saturday! Like a doll. Pretty post. a nice week ahead Mary. Very sweet! She absolutely brings joy to her family. Such a cute baby -- a great Pink Saturday post! What an absolute sweetie! Can't stop smiling when I see her plump cheeks! Happy Pink Saturday! Really cold (50s) in upper Michigan today with a dark sky. I need all the pink I can get this morning. Thanks so much for helping lift my spirits! Wishing you a weekend filled with sunshine and happiness. She is so cute! Who could'nt spoil her!I would just want to hold her all day she is so cute! Empress, princess, what ever you want to call her, she's a cutie pie! so precious Picture! how radiating her face is. Lovely, chubby and totally CUTE!. Oh, Mary, she is absolutely adorable! You just want to kiss her little fat cheek and sit there and watch her laugh! What a great pink post. Happy Pink Saturday to you, dear Mary, and here's hoping you're in the pink! Oh don't you just want to kiss that cute nose? What a living doll! Happiest of Pink Saturdays to you! Beautiful baby! And I just want to pinch those precious cheeks. Oh my word I want to pinch those sweet cheeks. What a precios, sweet baby! I will definitely curtsy to this beautiful 'empress' if I'm lucky enough to meet her! Beautiful girlie. Thanks for stopping by and leaving such a kind comment. Umm, love cauiflower, must look for these in my area (N. Carolina). Can see you have some yummy food things going on so I'll be back! 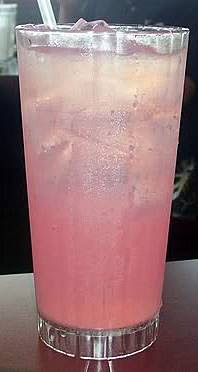 This is a girly lemonade. My girls love anything pink. Good idea. cute baby.. and slurrrp lemonade! perfect! Happy Pink Saturday, Mary! The little Empress is absolutely darling! She makes my heart smile! The lemonaide recipe sounds delicious and I'm definitely going to try it! She's so cute! I love her smile..
so adorable in pink and her smile, how cute!